It was a good thread. One of the many this year that caused me to order more trees than I need. I ordered Juliet from gurneys and both Juliet and Crimson Passion from honeyberry usa. Reason being, honeyberry usa stuff is usually pretty small whereas the bareroot Carmine Jewel I’d ordered from gurneys a few years ago was about 3’ tall. Thanks SMC I did read that thread and posted some pictures of my carmine Jewell’s . The Juliet looks really promising. Every thing I read about it makes them sound amazing. Have you looked into Crimson Passion? It’s supposedly the best tasting if the Romance Series. I only know what I have read online. They do look good. Juliet’s 22brix is very high sugar content. Carmine Jewell is 3.5g weight fruit whereas Juliet is 5.0g fruit so nearly twice the size. Have you looked into Crimson Passion? That is the one I want to get. St. Lawrence Nursery had 2’-3’ bare root plant for $20 last year, but I don’t think the new owner offers them. I missed out on that deal. Did you pic them up right at the nursery, or did they ship those unpruned? This is how they arrived. Im going to train them to a tree form, hopefully, so I trimmed everything but a central leader and the roots were so long I cut 2-3 inches off several of them to make them fit in the holes I dug. Stuck those in sand to see if I can get the root cuttings to grow also, just for kicks. 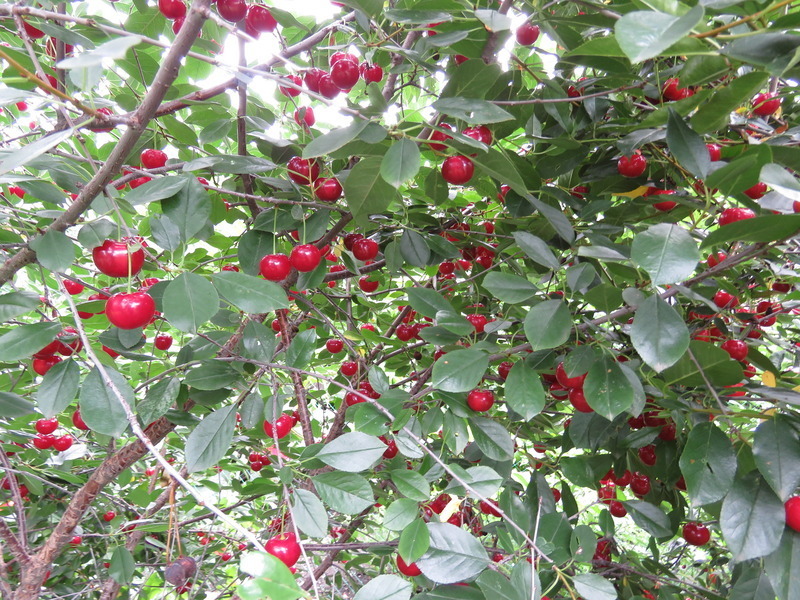 Below is a pic of my Juliet cherry on July 21 of last year, just before I did the main harvest. The cherries are actually much darker than they appear in the photo, but sometimes it’s hard to capture real colors in sunlight. I left some on the bush for another 4 weeks just to see how’d they do holding on the bush, and they then had a brix of 16. I didn’t yet have my brix tester when I did the main harvest, so I can’t say if the brix was any lower when I did the main harvest, or not. But taste seems more due to the balance between sugars and acids rather than just on brix, as I find the Juliet quite easy to eat out of hand, yet Romeo is too tart to eat more than a few, and it’s brix in my garden was 15.5, almost the same as Juliet. By comparison, my Carmine Jewels had a brix of 12.5. I’m not sure how accurate my Brix meter is, so there could be some differences there too. But is was a wetter summer than normal if I recall correctly, so maybe that did have an impact on Brix. Be interesting to see if Brix is the same or different this summer. Juliet finally in full bloom today, the first of my cherries to bloom. The Romeo on its left is just starting to bloom, while the Cupid on its right has lots of buds but is still probably a week away from flowering. It was a cool spring and I think this is the latest these trees have come into bloom. Garden spade just to the right of the Juliet, for scale. Beautiful. All those bushes look great. Have you prune them at all? How does Cupid taste? I would like to grow Cupid but I could not find any seller in the US. 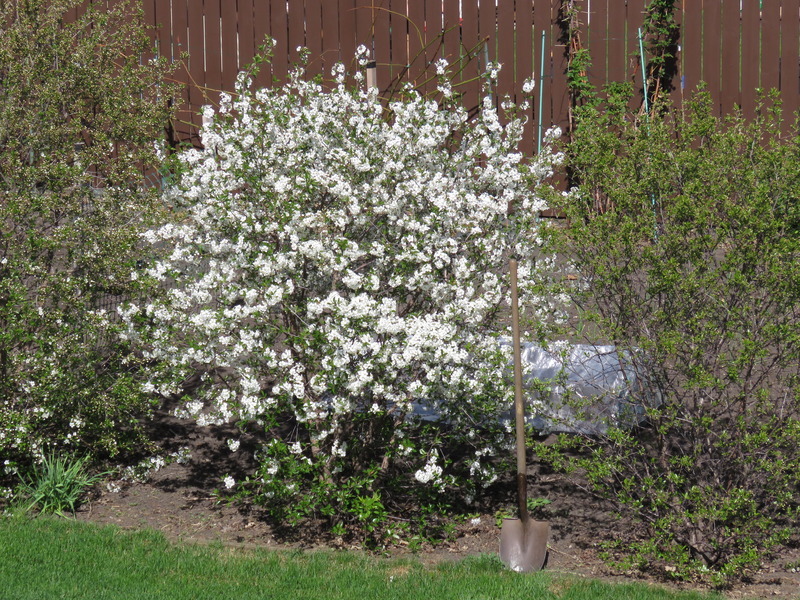 I haven’t done any pruning except to remove any dead branches and maybe trim the outside of the bush lightly to keep it in shape. I’m in Canada, pretty sure they can’t be sent across the border without phytosanitary certificates and import permits, etc. Im hoping to find someone able to send me some juliet pits after harvest this year. I have several trees but none have fruited yet. Id like to try to grow some seedlings to plant in various locations. Im willing to pay shipping! Thanks Id like to get around 100 pits, I planted some carmine pits last fall that came up nicely this spring, thinking juliet would do the same.